[T]here’s a very real chance that the Obama/Joker image is in itself meaningless. This is not to say, however, that the context is meaningless, or that the image is worthless. Quite the contrary, in fact – just because we can’t affix objective meaning to a given cultural artifact doesn’t mean there is nothing to learn. 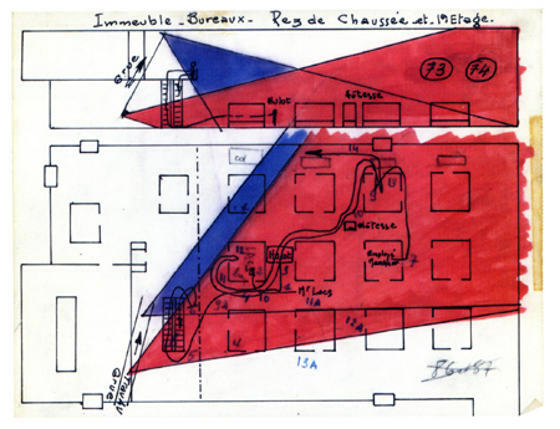 A plan for the movements of Hulot and the camera down the escalator and among the cubicles in Play Time. Via Observations on film art and FILM ART : Where in the world is M. Hulot? [T]he horizontal symmetry apparent in many Atari VCS games could be attributed to trends in the history of art or as a reference to the bilateral symmetry native to earthly animals. But such a response would fail to take into account the fact that the production of symmetry on the device is a convenience afforded by its hardware design, which provides memory-mapped registers capable of storing 20 bits of data for a screen-worth of low-res background graphics 40 bits wide. Doubling or mirroring the left half of the screen involves a single assembly instruction that flips a bit on another register. That convenience was further inspired by the way people conceived of videogames at the time. In this case, the relationship between design, material constraing, and individual expression is complex, irreducible to appeals to any one factor alone. The 20 bits of storage in registers PF0, PF1, and PF2 do not determine the aesthetics of a game like Combat, nor are they simple constructions of social practices. Ian Bogost – Media Studies and Realism. Transmedia Storytelling and Alternate Reality Games: A primer for non-specialist audiences. Henry Jenkins on Transmedia – November 2009 from niko on Vimeo. Compilation of essays related to the use of computers in humanities-based research. About Michael Mann and the aesthetic and narrative place of Miami Vice in his filmography.